"Jesus answered, “Truly, truly, I say to you, unless one is born of water and the Spirit, he cannot enter the kingdom of God." The Sacrament of Baptism is the first of the seven sacraments not only in time (since most Catholics receive it as infants) but in priority, since it is required to receive any of the other sacraments. Christ Himself ordered His disciples to preach the Gospel to all nations and to baptise those who accept the message of the Gospel. In His encounter with Nicodemus (John 3:1-21), Christ made it clear that baptism was necessary for salvation: "Amen, amen I say to thee, unless a man be born again of water and the Holy Ghost, he cannot enter into the kingdom of God." For Catholics, the sacrament is not a mere formality; it is the very mark of a Christian, because it brings us into new life in Christ, and we become members of His Church. Therefore, the Church takes baptism seriously - it is not a mere 'naming ceremony'. 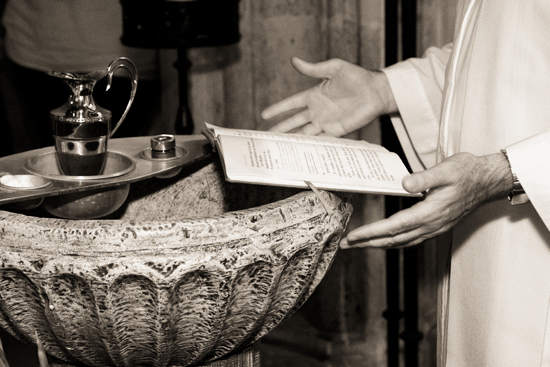 Parents seeking to have their children baptised are required to attend a baptism preparation evening, details of which can be found in the newsletter, and are announced periodically at Mass. Baptisms usually take place in the Church on Sunday afternoons. When applying for Catholic school places, priority is always given to those who come to Mass regularly. If you are a non-baptised adult seeking baptism, please visit the RCIA page.